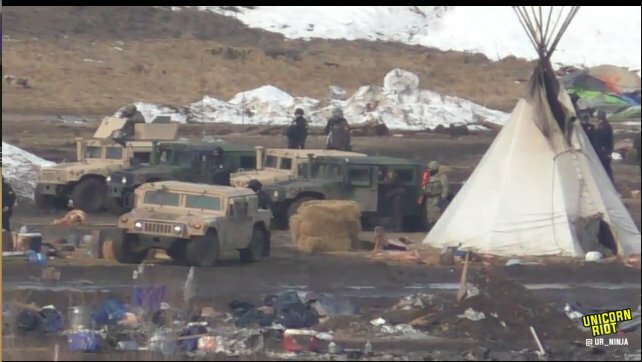 Armed police and military are now inside the Oceti Sakowin camp. Around 70 water protectors are still holding their ground. 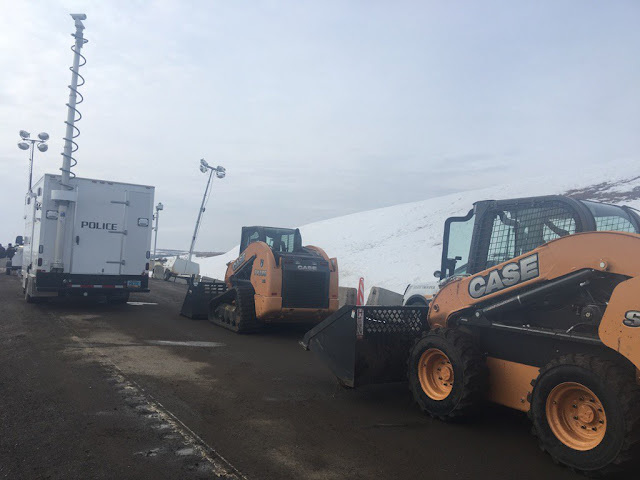 Most protectors left peacefully Wednesday, when authorities closed the camp on Army Corps of Engineers land in advance of spring flooding, but some refused to go. Officers checked structures and began arresting people, putting them in vans to take to jail. About two dozen people were arrested in the first half hour of the operation, according to Levi Bachmeier, an adviser to Gov. Doug Burgum. The operation began shortly after authorities said Corps officials had met with camp leaders. They didn't divulge the outcome of those talks. American Indian elders have told police there are people willing to resort to drastic measures to stay in the camp, Iverson said. Similar sentiments have been expressed by protesters on social media, Iverson said. "We're doing everything we can to avoid that kind of a situation," he said. "We don't want it to reach a flash point, but at some point, enough is enough." 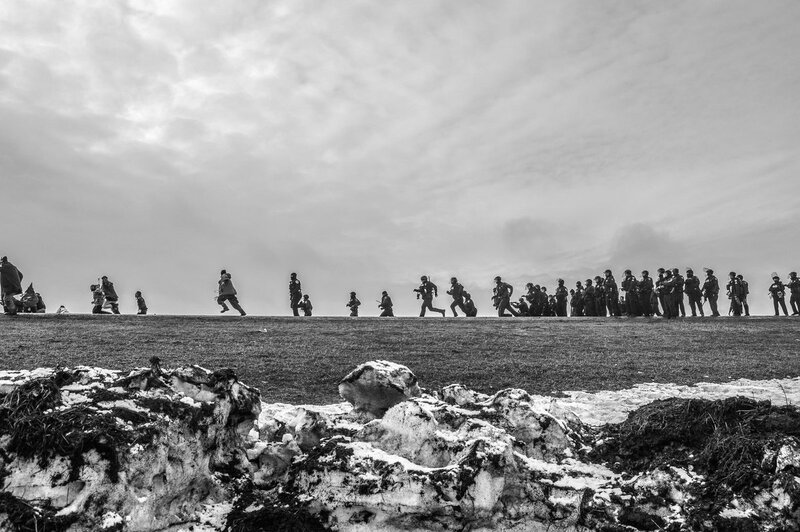 At its peak, the camp was home to thousands of protesters. 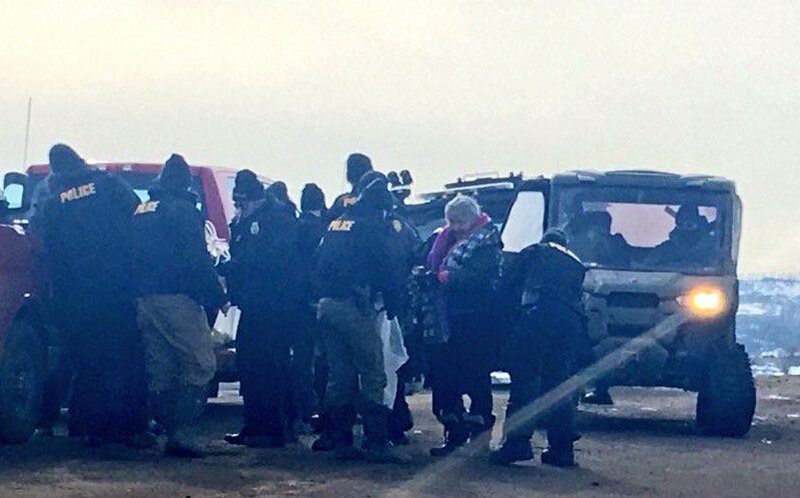 Burgum estimated Wednesday night that as many as 50 people remained in the camp. 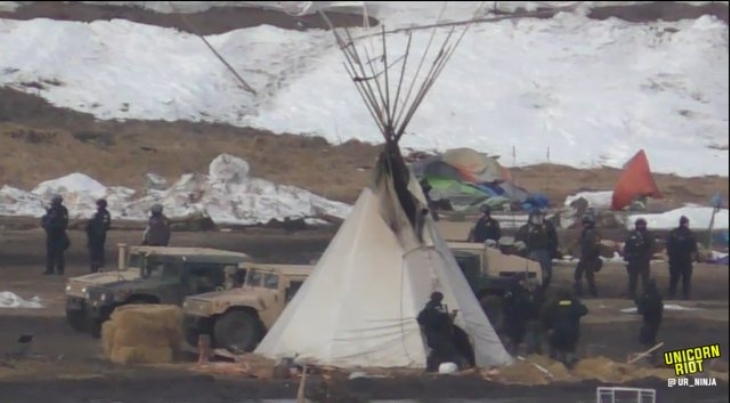 Police early Thursday said an additional 15 crossed a frozen river and entered the camp on foot. This is a shot of Police chasing reporters. Via Rob Wilson. 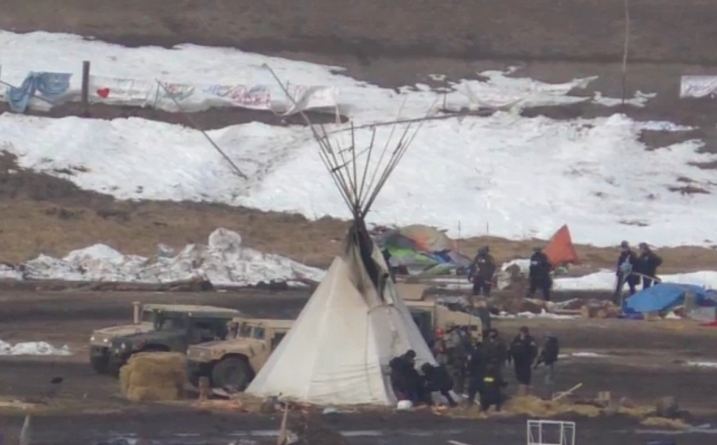 Pics of some of the last to leave Oceti camp yesterday, they stayed till the end. 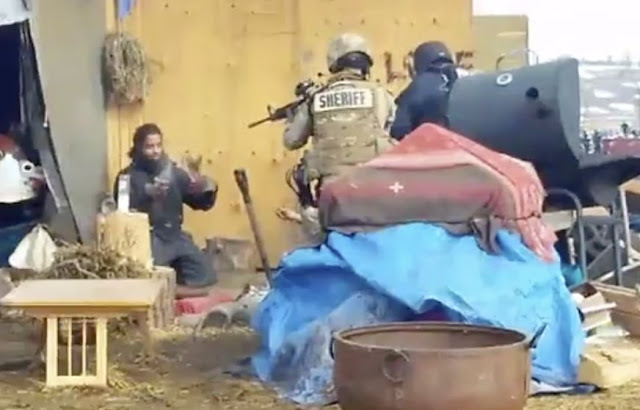 Responses to "Veterans, Elders Arrested: Scenes From Today's Standing Rock"
wonder why we, the natives were treated so mean, does the pipe line mean that much over human lives? Trump's execute order's ...now the pipe line will be in active construction within days..figure that out, after we helped save the world, during all WAR YEARS ..Native Pride..? SMH, Such a shame. 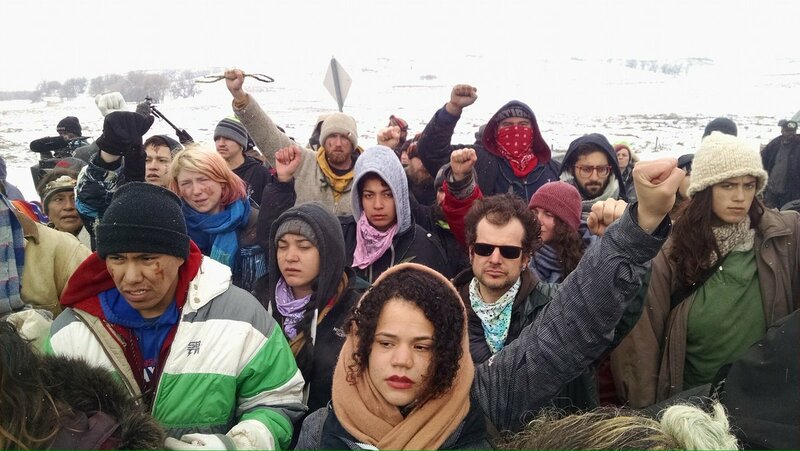 Arresting people for trying to save our own land. Just Asinine. SMH. Petrol dollar is still the money maker. The elite need to make their money. Trump needs to show everyone he's a jobs president. The elite want to ruin the water to put everyone in disease so big pharma cashes in and those elites that control fresh water for the plastic bottles cash in....it's a win all around for the power brokers.